National Recycling Week aims to improve the environmental benefits of kerbside, industrial and community recycling programs. In 2011 Planet Ark is targeting car batteries and electronic waste in particular, as many householders and businesses are unsure of how to dispose of these materials. "Australians are good recyclers of newspapers, cans and bottles, however e-waste is still a big problem," says Planet Ark's Manager of Recycling Programs, Janet Sparrow. "It's best to check RecyclingNearYou.com.au for information on local household recycling options, or BusinessRecycling.com.au for recycling solutions in the workplace." Workplaces and offices can get involved in National Recycling Week by hosting a Friday File Fling, a paper recycling initiative held on Friday of National Recycling Week (Friday 11 November). Employees of participating companies sort through filing cabinets and desk drawers to recycle redundant paperwork and old documents. "With only one in ten sheets of office paper currently recycled, Friday File Flings are a great opportunity to de-clutter offices, build team engagement and get recyclable paper back into circulation," says Sparrow. The Big Aussie Swap, is an event that allows people to exchange their unwanted goods for free, has proved popular in past years. Participants receive a token for every item they bring, which can be used to purchase items brought to the party by other people. "The Big Aussie Swap is a fun, free and frugal way to help the environment," says Sparrow. "By diverting items from landfill and avoiding buying something new, you save water, resources and reduce emissions - not to mention the impact on your wallet." This year Planet Ark has introduced a new initiative called the Tetra Pak Schools Recycle Right Challenge, which brings together a wide range of recycling-themed activities, lesson plans, supporting resources, and events ideas that have been developed specifically for Australian schools to make recycling fun and interesting for students. 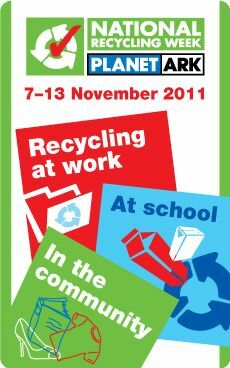 For further information about recycling or any of Planet Ark's National Recycling Week initiatives or to get involved, visit RecyclingWeek.PlanetArk.org or call the National Recycling Hotline on 1300 733 712. National Recycling Week is kindly supported by Tetra Pak, The Aluminium Can Group, Battery World, Century Yuasa, and 'Cartridges 4 Planet Ark'.